A news release last week from House Ag Committee member Antonio Delgado (D., N.Y.) stated that, “On Thursday, [Rep. Delgado] led House Judiciary Committee Ranking Member Jim Sensenbrenner (R-Wisc. ), House Agriculture Committee Chairman Collin Peterson (D-Minn.), and Reps. TJ Cox (D-Calif.), Kelly Armstrong (R-N.D.) and Dusty Johnson (R-S.D. ), in introducing the bipartisan Family Farmer Relief Act of 2019, legislation that would ease the process of reorganizing debt through Chapter 12 bankruptcy rules. The restructuring of the rules to make more farms eligible comes amid a continued downturn in the farm economy. “‘For folks in Upstate New York, farming is more than a job—it’s a way of life. And in this extremely challenging farm economy, we must come together to help our family farmers overcome years of low prices and increased market consolidation. The Family Farmer Relief Act will provide the critical restructuring and repayment flexibility these folks need to get through these hard times without permanently closing their operations,’ Delgado said. 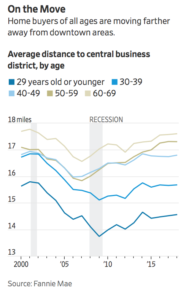 Wall Street Journal writer Laura Kusisto reported recently that, “The exurbs, the engine of the American housing market, are back. “A decade ago, the sight of new homes under construction in Maricopa, an enclave of tidy cul-de-sacs 35 miles from downtown Phoenix, was almost unimaginable. Four in five homeowners were underwater, with their outstanding mortgages worth more than their properties, according to housing data tracker Zillow. Neighbors felt compelled to cut the hedges and clean up garbage at empty houses. The Journal article explained that, “Across the country, the housing market overall has slowed. But in the regions just beyond the affluent suburbs, new home building and sales are showing signs of life. Rising mortgage rates and home prices, especially in urban centers, are once again motivating buyers to drive until they can afford a home, including in Dallas, Las Vegas, Atlanta and the San Francisco Bay Area. Low gas prices help as well. “Analysis by the National Association of Home Builders, set to be released later this year, shows that single-family construction rose nearly 7% in exurban areas in 2018 compared with a year earlier. Home building overall rose less than 3% in the same period. The group defines exurbs as outlying counties in major metropolitan areas. “A Decade After the Housing Bust, the Exurbs Are Back,” by Laura Kusisto. The Wall Street Journal (March 26, 2019). The Associated Press reported yesterday that, “A federal judge has awarded more than $181,000 in legal fees to seven lawyers who successfully fought a 2012 Iowa law that made it illegal to get a job at a livestock farm to conduct an animal cruelty undercover investigation. “Animal rights and civil rights organizations, including the Animal Legal Defense Fund and Iowa Citizens For Community Improvement, sued Iowa Gov. Kim Reynolds and others over the so-called ag gag law. In a recent article posted at The Des Moines Register Online, Molly Hunter reported that, “Normally, Story County soybean farmer Kevin Larson said he would resolve a dispute with a neighbor privately. “Instead, he went to the Iowa Pesticide Bureau in 2017 when he suspected powerful herbicides drifting from a nearby farm damaged his crop. The article noted that, “Increasingly, they are filing complaints with the state bureau about drifting herbicides, some with hopes of securing tighter regulations of powerful weed killers containing dicamba. “‘That’s the only way to get them to listen to you,’ said Larson, who farms near Story City. The article added that, “Iowa State University extension weed specialist Bob Hartzler said 90 percent of the 2017 drift complaints filed after June 15 of that year were about dicamba applications. The volatile nature of the dicamba plays a significant role in its destructive impact on soybeans. A news release last week from USDA’s Farm Service Agency (FSA) stated that, “Higher limits are now available for borrowers interested in USDA’s farm loans, which help agricultural producers purchase farms or cover operating expenses. The 2018 Farm Bill increased the amount that producers can borrow through direct and guaranteed loans available through [FSA] and made changes to other loans, such as microloans and emergency loans. The Direct Operating Loan limit increased from $300,000 to $400,000, and the Guaranteed Operating Loan limit increased from $1.429 million to $1.75 million. Operating loans help producers pay for normal operating expenses, including machinery and equipment, seed, livestock feed, and more. National Public Radio’s (NPR) Leah Douglas reported today that, “Every state has a ‘right-to-farm’ law on the books to protect farmers from being sued by their neighbors for the routine smells and noise created by farming operations. But this year, the agriculture industry has been pushing in several states to amend those laws so that they will effectively prevent neighbors from suing farms at all — even massive industrial livestock operations. “The push is a response to the millions of dollars awarded so far to five groups of farm neighbors in North Carolina who sued a subsidiary of Smithfield Foods, the biggest pork company in the country, over air pollution — including the manure particles and intense odors put out by large hog operations. The first of 26 lawsuits against the company, representing nearly 500 plaintiffs, was heard in 2017. Wall Street Journal writer Laura Kusisto reported earlier this week that, “House flipping is back to nearly the same level it was around the 2006 peak of the housing boom, when it became a symbol of the rampant speculation that soared before the bubble burst. “But a new analysis from CoreLogic Inc. suggests most of the current flips are less risky than those more than a decade ago, making today’s flippers less likely to cause market volatility if prices decline in the next few years. Ms. Kusisto added that, “Professional flippers can be stiff competition for first-time buyers, helping to drive up the price of lower-cost starter homes. They can, however, also help to create more inventory because many younger buyers don’t have the skills or cash needed to fix up older, dilapidated homes. A recent update from the National Corn Growers Association indicated that, “The National Corn Growers Association – in partnership with the Honey Bee Health Coalition – is releasing new best management practices (BMPs) to protect bees and other pollinators in and around corn fields. “At roughly 92 million acres, field corn covers more land than any other row crop in the country, and in the Midwest Corn Belt, corn often makes up to 40 percent of the landscape or more. The BMPs presented in the NCGA’s new guide identify potential effects of agricultural practices on bees at each stage of production and recommend ways to mitigate those impacts. “Corn farmers who rotate with soybeans could also see added benefit from their pollinator stewardship because bees can increase soybean yields by up to 18 percent, according to a 2005 study. DTN writer Todd Neeley reported last week that, “The Texas attorney general is pressing a federal court in Galveston, Texas, to issue a national injunction on the 2015 waters of the United States, or WOTUS, rule after a court in Ohio denied a similar motion in recent weeks. “After a long series of court actions in the past couple of years, a split remains between states still under jurisdiction of the 2015 rule and those that are not. The DTN article stated that, “In the meantime, the EPA continues a public comment period on a proposed new rule. Wall Street Journal writer Aaron Back reported earlier this week that, “For banks, slowdown fears come with a silver lining. 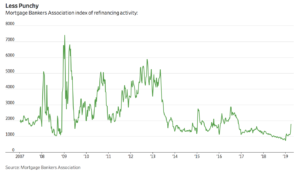 Sharply lower lending rates typically spur a surge in profitable mortgage originations as existing or aspiring homeowners pounce. This lining loses some of its luster every time storm clouds gather, though. “Interest rates have plummeted in recent weeks after an especially dovish policy statement last month from the Federal Reserve. The yield on 10-year U.S. Treasury notes fell from 2.61% on March 19 to 2.37% on March 27. “Mortgage Surge a Mixed Bag for Lenders,” by Aaron Back. The Wall Street Journal (April 3, 2019). The Journal article stated that, “The volume of refinancing applications was only around 60% of those seen in a prior surge in the summer of 2016, though. What is more, as Mortgage Bankers Association Chief Economist Michael Fratantoni notes, it was only around a third of peak volumes in the post-crisis years of 2009-2012. “Homeowners in that period had taken out mortgages at much higher, pre-crisis interest rates so they had much more to gain by refinancing at lower rates. Today most homeowners either bought or have already refinanced at some time during the long era of low rates that followed. The result is that every downdraft in rates now brings less of a response in terms of refinancing demand.